5" Rigid Caster - Polyurethane Tread on Poly Core - 600 Lbs Cap. 5" Rigid Caster Rubber Tread on Metal Core Wheel - 400 lbs Cap. 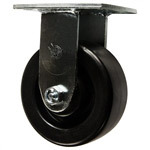 5" Rigid Caster - Rubber on Aluminum Core Wheel - 500 Lbs Cap. 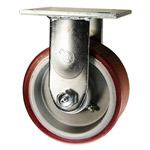 Top plate size: 4" x 4-1/2"
5" Rigid Caster - Poly Tread on Aluminum Core Wheel - 900 Lbs Cap. 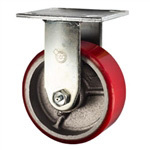 5" Rigid Caster - Solid Polyurethane Wheel - 1,000 Lbs Cap.